Who uses the golf pencil? Just to name a few; Churches, lotteries, marketing surveys, & mini-golf courses make great use of the personalized golf pencil. The pencil's small size makes it extremely convenient. And, the full color imprinted message makes the golf pencil a useful promotional tool in even more applications. What are the various golf pencil styles? Golf pencils are much like other pencils in the fact that they come in various shapes, colors, and configurations. There are two basic shapes; round & hex. You can also order with or without an eraser. What can be printed on a golf pencil? Printing your text, logo, or mascot on a golf pencil can bring you great promotional benefits. 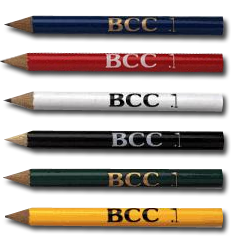 You can choose from a wide variety of pencil colors and customize your imprint accordingly. Some of the more advanced websites will even allow you to customize your pencil right on the screen. Due to the small size, golf pencils seem to end up with the pencil user more than other pencils. This creates additional exposure for your message. How much to custom golf pencils cost? Even a custom imprinted golf pencil can be purchased for as little as .05 cents. Considering it's low cost, functionality, and promotional capabilities, the golf pencil may well the world's best custom pencil!